The sump pump has been frequently used in places in which basement flooding is a regular activity. It not only solves the purpose of dampness, but also ensures that it can keep the foundation of the building dry. Whenever there is a problem of dampness making its way into the foundation of that house, using the sump pump is something which becomes second nature. It is with the help of this pump that you can extract the water from any place, and throw it away to places such as the municipal drain or even the open drain located beside your house. Sump pump has a lot of popularity in places that are below the ocean level. Places like Florida require sump pump, and hence a lot of companies have targeted in manufacturing such products. We bring to you some of the best products in the market in 2016. Little giant 1/3 horsepower submersible sump pump:- The little giant contains a pressure switch which can make it one of the most popular sump pumps in the market. It can work pretty well when it comes to moving a pretty large volume of water. The product has been designed to be used continuously, without any tiring. With a very easy interface to use and install, this product gets a commendable 4.3 out of 5 stars from its users. This pump comes with 1/3 horsepower and also contains a 5 inch head. The 1/3 horsepower also comes with a shaded pole motor, that has an overall protection. The pump has been designed keeping in mind its continuous use. The iron quoting has been coated with epoxy in order to prevent rusting due to constant contact with water. It also has sleeve bearings. 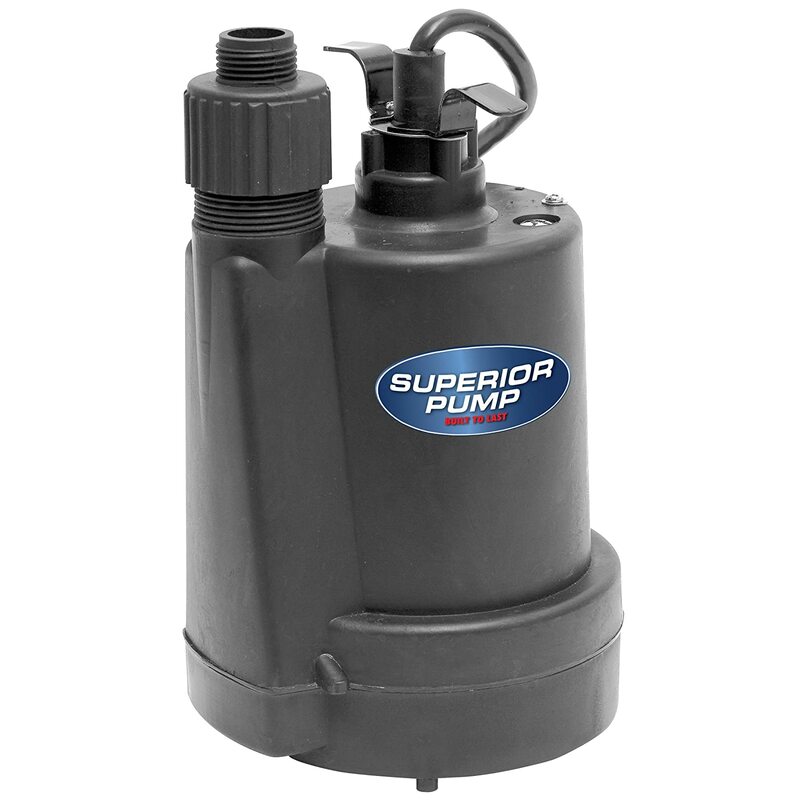 Superior pump 91250 thermoplastic submersible pump:– With superior pump offering an exceptional package of power within a durable frame, the ability of this sump pump cannot be contested. It has the capability of pumping at least 30 gallons every minute, and up to a vertical height of 25 feet. The thermoplastic construction as well as a wonderful design enables this product to fit even in a 6 inch opening. It has been designed keeping in mind the drainage of standing water from any enclosed environment. This sump pump is ideal for any kind of flooded basement or residential complexes. With customers giving it a 4.5 out of 5 rating, you realize the true potential of this product. With ¼ HP power, this pump has the capacity of pumping 1800 gallons every hour. It has a bottom suction filtered which has been designed to remove water at least till 1/8 of an inch is remaining. This product has been backed up by at least one year limited warranty. 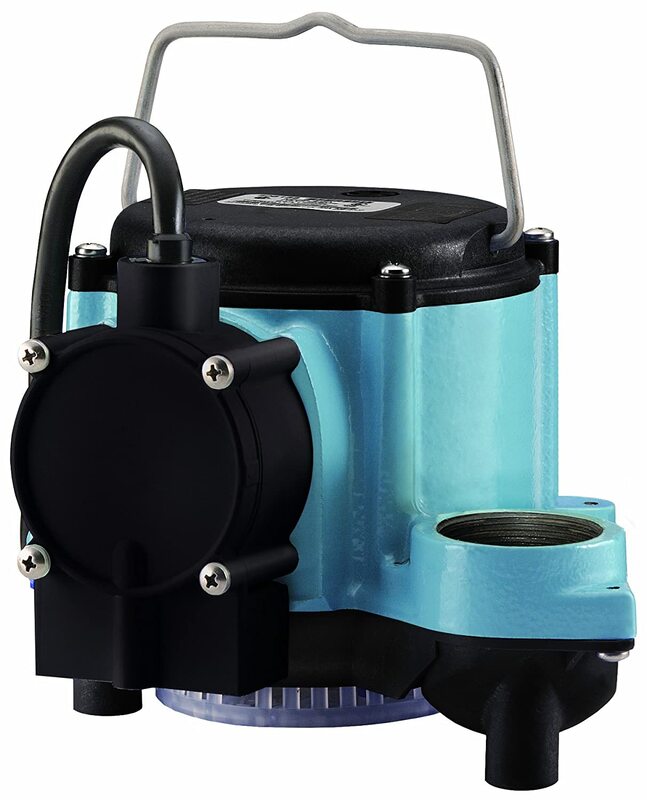 It can be used as a sump pump by simply adding an optional float switch. It also contains a garden hose adapter. 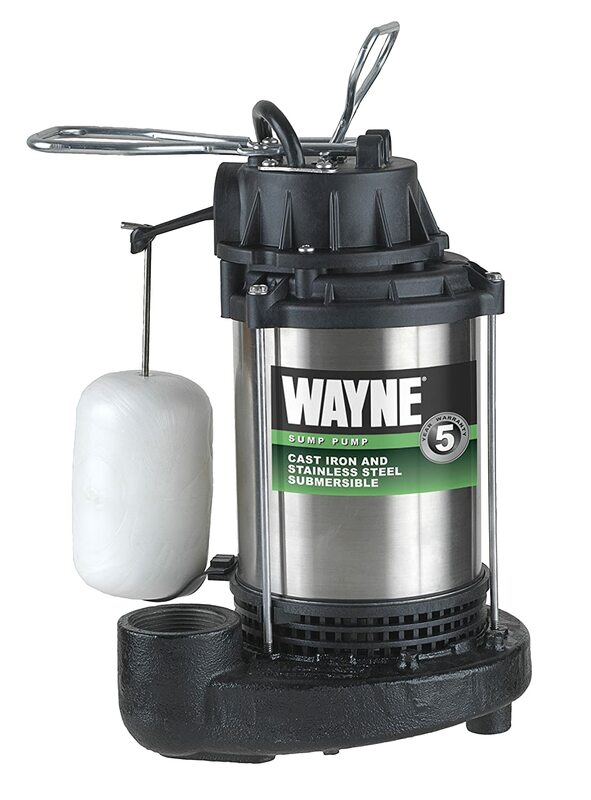 WAYNE CDU980E submersible sump pump:- The Wayne submersible pump has a capability of removing at least 4600 gallons every hour. It is mainly due to this top section design filter that has been created in such a manner that it can minimize the clogging due to debris. Also, it comes with a stainless steel design and a cast iron submersible pump, making this product effective in any environment. With 4.5 out of 5 stars, this product is truly revolutionary in this category. The parts have been assembled in the United States, thereby providing it with a natural guarantee on its quality. The suction pump located in the top has been designed keeping in mind the need to minimize the airlocks as well as clogging from the debris that is located in the bottom of the sump pits. It has a stainless steel motor that has been housing the basic design, and is also enabled to provide the maximum output. 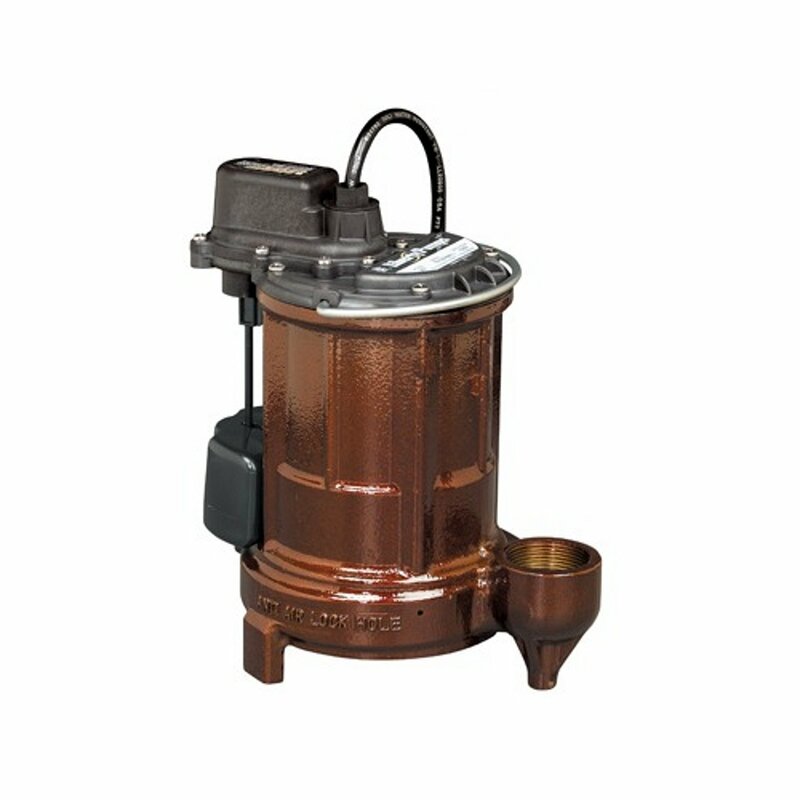 It contains a vertical float switch, which makes it pretty effective as a sump pump. It has a maximum power of ¾ HP, thereby producing about 4600 gallons per hour pumping rate. 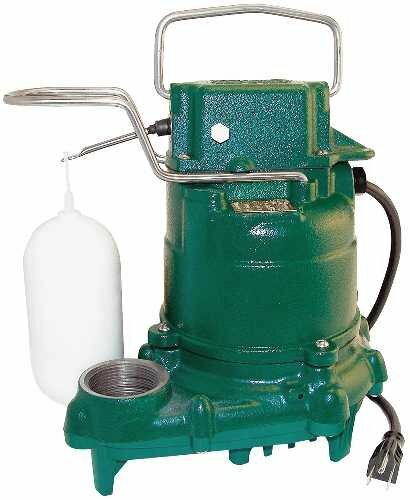 Zoeller M53 submersible sump pump:- The Zoeller submersible sump pump is amongst the best that you can find in this market. It has been the steady choice of contractors and plumbers in this market, and it is mainly due to the plastic Vortex impeller as well as a wonderful cast housing that makes it an attractive feature. With 4.7 out of 5 stars, this product is certainly going great guns in this market. The sump pump contains a 1/3 HP power motor. It contains an impeller design which is non-clogging which is otherwise almost always the problem with sump pumps. It is made out of a durable cast iron, which also comes with pump housing as well as a switch case. It has an automatic float activated switch for the benefit of pumping. Liberty pumps 257 cast iron automatic submersible pumps:- The liberty pumps 257 cast iron automatic submersible pump comes with a 10 feet power cord and also has thermally protected lubricated motor for effective use. The vertical magnetic float or the VMF has been recommended due to the frequent on-off switch. With 4.6 out of 5 stars, this is the best sump pump in the current market. The pump is capable of pumping water up to 50 GPM. The pump has a maximum discharge ahead of 21 feet. The motor design is pretty efficient and it can reduce the usage of electricity by at least 40%. The pump comes with a magnetically operated VMF switch which for the shallow pits and comes with a three year warranty. Flotec FPPM3600D pedestal sump pump:– The Flotec pedestal sump pump is amongst the best in the market. With its cast iron construction, as well as the inlet, it will prevent any kind of debris from entering into the pump. Moreover, the pumping performance is also posted with the heavy duty motor that has been attached to this device. With easy installation and stainless steel be used in the engineering, this product gets a commendable 4.0 out of 5 stars from its users. This pump has the capacity of pumping at least 3480 gallons every hour. It is a heavy duty pump, and consist of 1/3 HP motor. It has a top screen inlet that comes with a 1.25 inch discharge. It has the impeller which is non-clogging. 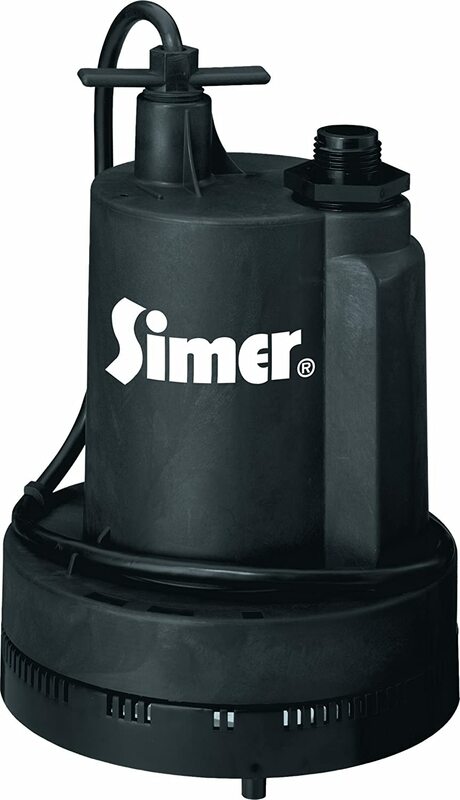 Simer 2305 submersible sump pump:- The Simer submersible utility pump not only contains an 8 foot power cord, but also comes with a thermoplastic design which is free from any corrosion. It also has the maximum pumping capacity of 1260 gallon per hour, and also has a motor that provides extremely high efficiency. With 4.2 out of 5 stars, this is the brightest from the young generation sump pumps in the market. The construction of this sump pump is due to extremely strong thermoplastic materials. Due to the nature of construction, it is pretty portable and light, and therefore can be used under any circumstances. It has a pretty simple plug-in operation, thereby making it very easy to use. It also comes with a garden hose adapter. This product comes with a minimum of one year warranty.